This charming gothic interior was the private study in the Cottage Palace, St. Petersburg, Russia, of Alexandra Feodorovna, wife of Nicholas I. Born Frederica Louise Charlotte Wilhelmina of Prussia, Charlotte, as she was known, was promised in a political alliance to Grand Duke Nicholas Pavlovich in 1814. They married three years later and by 1825 the couple became Tsar and Tsarina of Russia. While they reportedly enjoyed a happy marriage, the Tsarina was never comfortable in the formal interiors of the Peterhof Palace. She longed to “rest her eyes from all that gold.” In a gift to his wife, Nicholas commissioned architect Adam Menelaus to design (1826-29) a more intimate “bourgeois” cottage in the English gothic style (the architectural craze that spread over Europe in the early 19th century), where they could enjoy a more private life. The house became their favorite spot to spend summers. 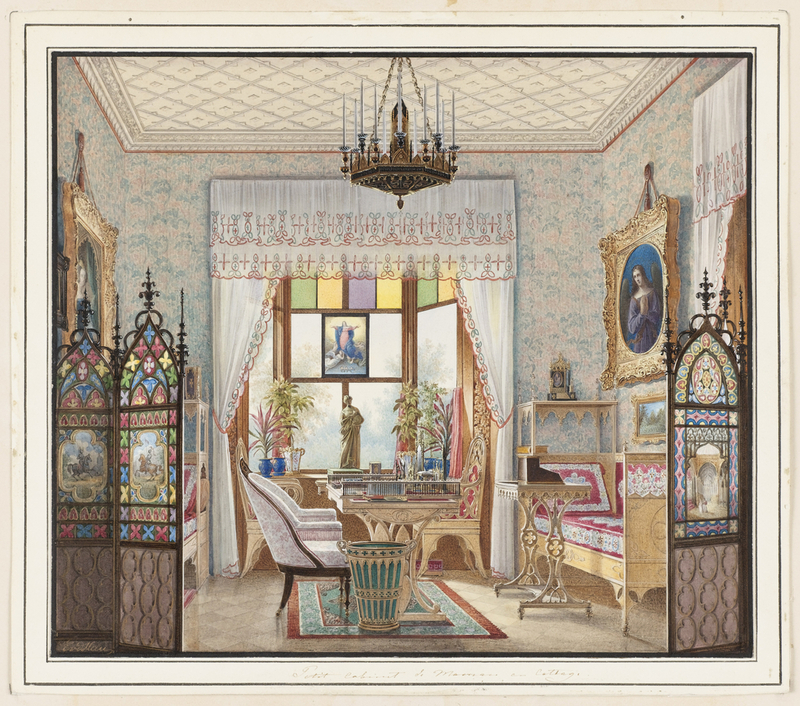 The study’s interior shows a roster of gothic details, two gothic screens with stained glass and trefoil decoration, a gothic-revival chandelier, curtains with gothic motifs, and a portrait on the left wall of Tsarina Alexandra Feodorovna’s mother, Louise of Mecklenburg-Strelitz, sitting beneath a gothic arch. The waste basket and the chandelier are in the style of the English Gothic revival architect, Augustus Welby Northmore Pugin. The other furniture is probably from the workshop of the celebrated St. Petersburg cabinetmaker, Peter Gambs. Today, the Cottage Palace is open to the public, and the room retains many of its original architectural elements including the colored glass bay window, the stucco ceiling, the parquet wood floors and the painting hanging on the left wall. Some of the furniture has been replaced with other Russian gothic revival wooden pieces. Dr. Gail S. Davidson was formerly Curator and Head of Prints, Drawings & Graphic Design at Cooper Hewitt, Smithsonian Design Museum.